Planted Freshwater tank pioneer Takashi Amano has passed at 61 years old from Pneumonia in his hometown of Niigata, Japan. Takashi Amano is known throughout the world as one of the best aquascapers and the founder of Aqua Design Amano, better known as the ADA line of aquarium products. His beautiful underwater landscapes were something to dream about accomplishing for many of us as young budding aquarists. As a young man seeing pictures of Amano tanks in magazines and books gave me the inspiration to cast off the neon rocks and bubbling treasure chests and aspire towards a higher level aquarium keeping and understanding of the ecosystem I was so keen to reproduce in my hand me down glass box. Takashi may be most well known in the industry for his lush, beautifully aquascaped tanks that are often flowing over the top with greenery and carefully chosen rock or wood pieces that perfectly transport the underwater world into the surrounding office or living space. However he had dueling passions that competed for his time, often inspiring and complementing each other. Takashi’s other passion was photographing nature across the globe in a way that no others had done. Much like works by Ansel Adams and M.C. Escher, Amano’s photography and epic aquascaping are instantly recognizable as his work. Known for being determined and dedicated, he guided his workers to perfection at the most minute of details, often removing and beginning again with aquascaping that did not please him. His workers worked tirelessly often inspired by their leader’s vision and just as often by his demanding nature. Takashi had the reputation of being firm in his dealings with both his workers and hobbyists who were lucky enough to enjoy one of his lectures. He often guided them in the art of design and was not shy about criticizing works but always with an eye towards teaching the recipient of the criticism and those around him. To speak with Takashi Amano and receive constructive correction has been considered an honor by many in the industry and hobby. Many of today’s freshwater plant species and shrimp species have become staple aquarium offerings as a result of the work that Amano did in the 70’s, 80’s and 90’s. His understanding of the intricate balance of plants and animals in the aquarium industry has given the average hobbyist a vastly improved selection from the humble beginnings he himself started with. 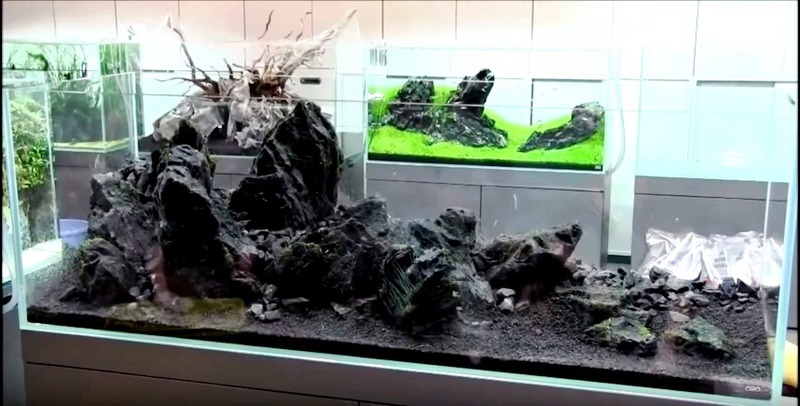 He has also developed tools and equipment for use throughout the hobby and most of them have become staples in the freshwater planted tank scene. Almost all high end shops carry the ADA line of products and offer books and magazines tailored to an industry that truly has Takashi at the center of it. The loss of Takashi Amano is one that will be felt by many of us but we can all celebrate the life that he brought to our eyes through his photography and discerning eye for aquarium design. His beautiful tanks span across the globe and if you ever have the opportunity to see one, please take it, it’s something that you do not want to miss and it’s an experience that cannot be replicated.